If you posted an audiobook review today, Monday June 21st, please leave your link in the Mr. Linky before midnight Central time (US) and you will be eligible to win a prize. In Beck’s first book, “Expecting Adam,” she told the story of her chaotic second pregnancy while she and her husband were in graduate school at Harvard. I was fascinated by the story she was telling, until she started feeling mystical presences everywhere, then the book gave me a major case of the eye rolls. This memoir comes after “Expecting Adam” chronologically and details their move back to Utah to be nearer her family and away from the anti-family culture they felt pervaded at Harvard in the 80s. Beck and her husband were both Mormons and, in fact, Beck’s father is a big deal Mormon scholar. When the two of them returned to Utah, they both quickly got jobs at BYU, but both of them also began to feel the pressure of the church censoring what they taught – or at least strongly suggesting that they stay within certain lines in their teaching. Both of them begin bumping up against those lines set by the church and,eventually, Martha begins to feel inexplicably ill, until she has a revelation about her past that changes both of their lives. Beck tells her story in “Leaving the Saints” in a very fitting format. She alternates between a scene in a hotel room in which she is confronting her father about something – we don’t find out what until some way into the book – and a chronological telling of the rest of her story. She actually starts with her marriage in the temple, glazes over their time in Harvard, and then goes more in depth as she moves into their return to Utah. I appreciated that she was relatively respectful of Mormonism – or at least of Mormons – despite her personal problems and issues with the religion. For instance, she was relatively reserved as far as sharing most of the rituals of the marriage rites, which are supposed to be sacred and secret. Now, I’d understand completely if people inside the Mormon church didn’t fully agree with me about her respect because things are obviously different when something is directed at something else near and dear to your heart, but I felt like she tried to be respectful of Mormons-as-people even though she had problems with the political structure of the church. I did have a little bit of trouble with the memories that Beck uncovered. I didn’t want to be that person who just didn’t believe her but, at the same time, it was just the way she remembered. She was living more or less happily in ignorance then – bam! – uncovered repressed memories. The evidence she presented for her memories made total sense, but the sudden and complete nature of the memory retrieval that seemed…odd…to me. It brought up my own memories of the eye roll-inducing moments in “Expecting Adam,” which probably made it all the more suspect for me. Even so, I decided to suspend judgement and just let Beck tell me her story as she wanted to. 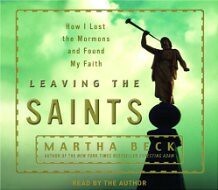 Martha Beck narrated her own story in “Leaving the Saints.” At first, I thought this was an extremely bad decision by her publisher, because her voice drove me absolutely insane. It was scratchy and rough and did not make for a very good listening experience. However, I do think it ended up working in favor of the story because, as things got more and more personal and painful, it was very moving to have her narrating. Even so, I’m glad it was a short audio – under 5 hours – because I’m not sure I could have take her voice much longer. If you are interested in Beck’s story of coming to terms with difficulties in the religion she was born into, then the audio could be a good way to go. 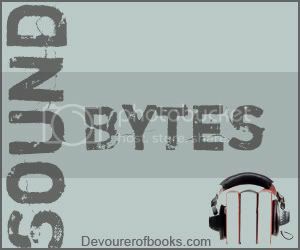 Just make sure you are willing to to go through a little auditory annoyance to get the added value of having the author tell you her own story.